Todd Marks, two-time EY Entrepreneur of the Year nominee, member of Baltimore Magazine’s 40 under 40, and The Daily Record’s Innovator of the Year is the founder and CEO of Mindgrub Technologies. Mindgrub, a Clutch.co Top Web Design Firm, a member of the Inc. 5000 for five years running, and the Maryland Tech Council’s Tech Company of the Year is an agency at the intersection of technology and business, designing and engineering solutions that define a company’s digital presence. 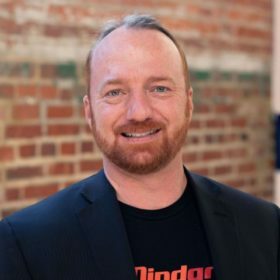 Marks founded Mindgrub in 2002 and has since overseen award-winning projects for clients such as Wendy’s, DELL, Exelon, Under Armour, Yamaha, Crayola, Adobe, Geico, ORACLE, A&E, The Economist, Polk Audio, University of Maryland, NASA, The Smithsonian, and Discovery Communications. Marks, a teacher-turned-technologist serves as the agency’s Chief Everything Officer, leading information architects, user experience specialists, creative interface designers, digital marketing experts, and world-class developers to solve business challenges in the areas of mobile and web application development, digital and traditional marketing, virtual and augmented reality, enterprise information systems, and more. Recently, he built a Holodeck at Mindgrub headquarters to serve as space for the research and development of virtual, augmented, and mixed reality training applications. In addition, Marks has spearheaded Mindgrub’s robotics division and has launched the agency’s first robot called SNAX, which will serve as a digital docent in the Mindgrub office and serve snacks and drinks to employees and guests. He has been recognized for excellence in leadership multiple times by The Daily Record, as he was named one of Maryland’s Most Admired CEOs three years in a row. Marks has shared his vision for innovation in technology and business at conferences such as SXSW, Adobe Max, and SALT, and has been profiled in The Huffington Post, CNN, and Newsweek. He currently serves as the Tech Board Chair for the Maryland Tech Council and is a member of the Northeastern Maryland Technology Council Board of Directors and the Loyola University MBA Program advisory board.